Dale Pene - Age Concern Wanganui's own Mr Whanganui raising funds Friday 27th February 2015. Thanks Dale!! Craig Hanford - volunteer receptionist for a day. Craig also assisted in delivering meals on wheels as did John Maslin (Wanganui Chronicle). Thanks guys!! 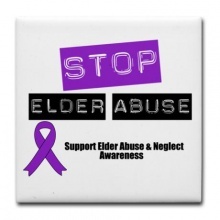 IT'S TIME TO STOP ELDER ABUSE!! It doesn't just happen for one day or one week each year.....it happens everyday and every week! Thanks to all involved with Age Concern Wanganui’s Expo 4 Info on Friday 1st November. Exhibitors, volunteers and a special thanks to staff, friends and families. A great day! !